Arnold Schwarzenegger turned 70 years old on July 30 but he's the one doling out the gifts. Prime example: The Governator shared a video clip on social media of a special dance interlude at his weekend birthday party featuring him alongside longtime friends Sylvester Stallone and Tom Arnold. "I always say to stay hungry and never stop learning, so as a sign of my gratitude, here's a video of birthday party hula lessons," Schwarzenegger posted on Twitter and Instagram on Tuesday. The clip comes three days after the Saturday night event which featured Schwarzenegger looking happy and relaxed with a cigar sticking out of his mouth. 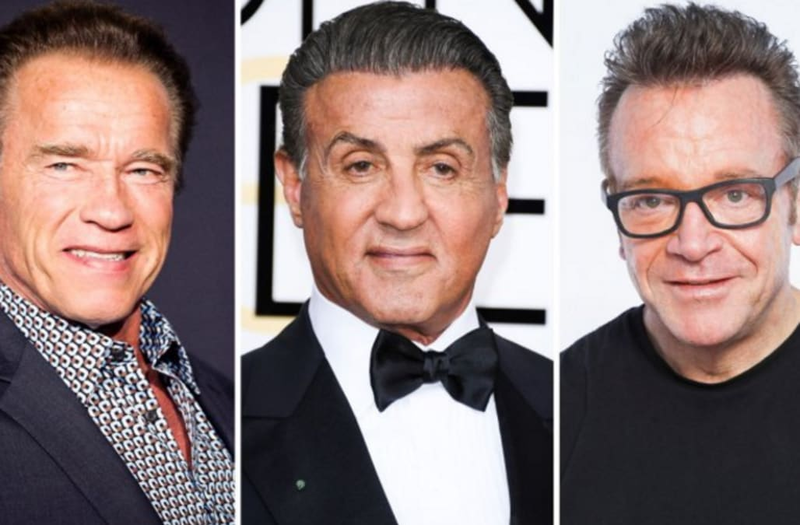 Decked out in jeans, a vacation-ready island-style shirt and Adidas sneakers, Schwarzenegger is flanked by Stallone (also chewing on a cigar) and Arnold as they take direction from a female instructor in how to turn their hips and get into action. There were also fire dancers, a tiki bar and an island-themed photo booth. James Cameron, who directed Schwarzenegger and Arnold in the 1994 action comedy True Lies, was also in attendance. It was Stallone, though, who gave one of the night's big speeches to honor his friend. "You don't quit, you don't quit, and you still don't quit. It's boundless energy," said Stallone, who turned 71 this summer. "But, you've been a fantastic enemy and a better friend. That's all I can say bro. Congratulations." Back to the dance: The party contest was enough to inspire Arnold to think of the big-screen possibilities. "Here's the pitch: Me and worlds 2 greatest 70 yr old action stars. Practically writes itself," Arnold quipped on Instagram. Good thing they already know a director.